Many homeowners in Round Rock, Texas, enjoy a patio-centric outdoor lifestyle. The patio as a place for relaxing and entertaining friends is a long-standing Texas tradition. For the most part, Round Rock is no different in that respect. Keep in mind, though, that we do have a healthy population of deck people in Round Rock as well. Archadeck of Austin remains neutral. We are equally thrilled to design and build patio projects and deck projects for our friends and neighbors in Round Rock, TX. You can rely on us for innovative, custom designs and top-quality construction regardless of your patio vs. deck preferences. One thing area homeowners agree on: the need for shade. This unique deck we designed and built for a Round Rock TX client took national honors in Archadeck Outdoor Living’s Design Excellence competition in the deck category. • If you want to replace your old deck with a new deck, we won’t try to talk you into a patio instead. We may suggest it, but ultimately the decision is yours. • We can incorporate Texas limestone into any Round Rock TX outdoor living project you desire, even a deck. • You can have an outdoor kitchen on your deck. If anyone tries to tell you otherwise, call deck designer Archadeck of Austin. • Small pergolas are primarily decorative. If you want a pergola large enough to cover your entire deck, we can design that for you. Pergola builder Archadeck of Austin custom designs each of our outdoor living projects for one home based on the client’s requirements and preferences. For their award-winning deck, these Round Rock clients chose low-maintenance AZEK decking. This is a top-of-the-line synthetic (PVC) decking material that will never need sanding or staining. 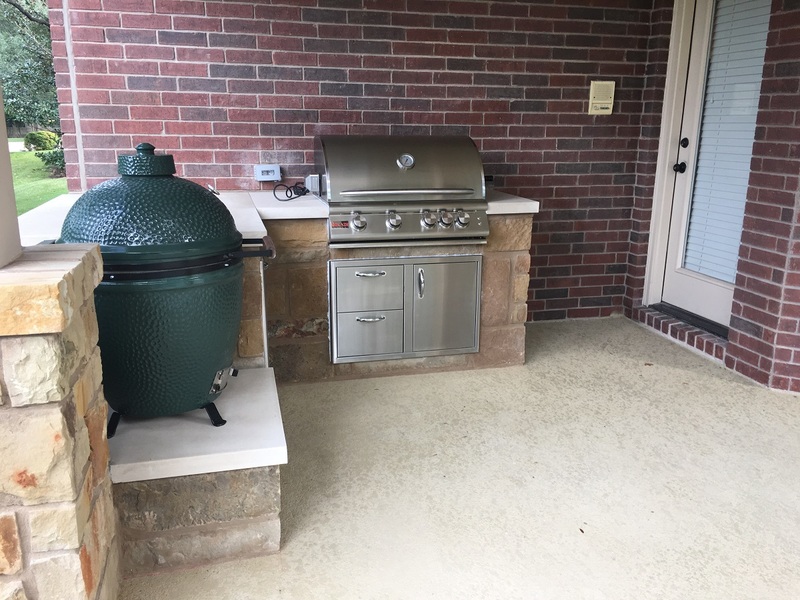 We constructed the deck skirting and outdoor kitchen with white limestone, while the kitchen counter features beautiful, brown Lueders limestone. The homeowners wanted their pergola to provide a good amount of shade, and for that we added a polycarbonate cover over the pergola. This cover filters out UV rays and provides shelter from rain. 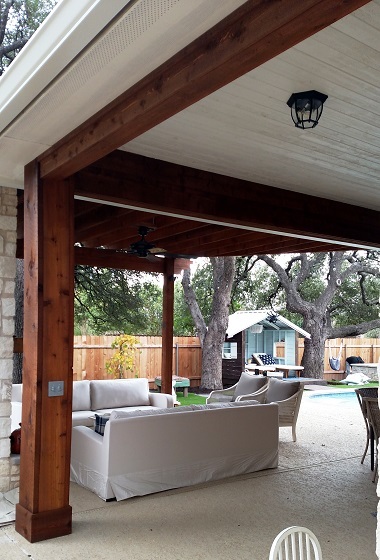 • Archadeck of Austin will go to any lengths to design a covered porch or patio with maximum usable space. We use all means possible to avoid placing support posts or columns in the middle of your outdoor living space. • While pergolas are considered shade structures, they may not provide as much shade as you want. Be sure to let your Round Rock TX pergola designer know if you want extra shade protection. • A Round Rock TX covered porch or patio is the perfect setting for an outdoor fireplace and a wide-screen TV. • Whenever possible, Archadeck of Austin uses materials that blend with your home. Our goal on every project is to ensure that your new outdoor living space doesn’t look tacked onto your home as an afterthought. 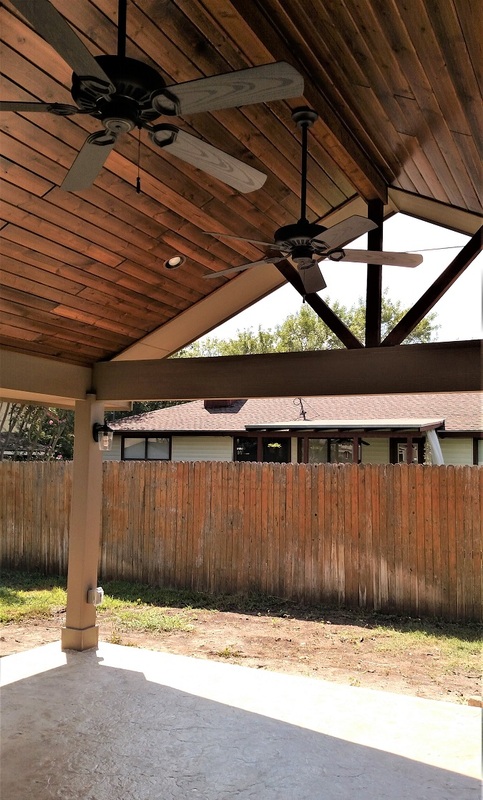 This Round Rock covered porch expansion featured a new custom pergola and outdoor fireplace Without changing the roof that covered the existing porch, we added quite a bit of space to the porch footprint. We designed a large pergola to cover most of the new porch area. To obtain the amount of shade the clients wanted over the new area – and protection from rain – we covered the pergola with a Polygal sheet that filters UV rays. This kind of cover allows in some of the light that a porch roof would block, providing the homeowners with light and shade at the same time. We constructed the outdoor fireplace with limestone matching the home’s exterior. Are you thinking of adding or replacing a deck, patio, or porch at your Round Rock, TX, home? Call Archadeck of Austin today at 512-259-8282 or email us to start that conversation. • Not every outdoor living project needs to be massive to be effective. • Outdoor kitchen designer Archadeck of Austin can build your outdoor living project to fit the scale of your home. • It is possible that a simple outdoor kitchen can meet your needs without taking up too much space on your porch, patio, or deck. • Working with a smaller budget doesn’t have to rule out the luxury of adding an outdoor kitchen to your home. Instead of assuming you can’t afford an outdoor kitchen, start a conversation with your Archadeck of Austin design consultant. You’re likely to find we can design the project you want within a budget you can afford. While bigger is better for many Texas homeowners, that’s not true for everyone. 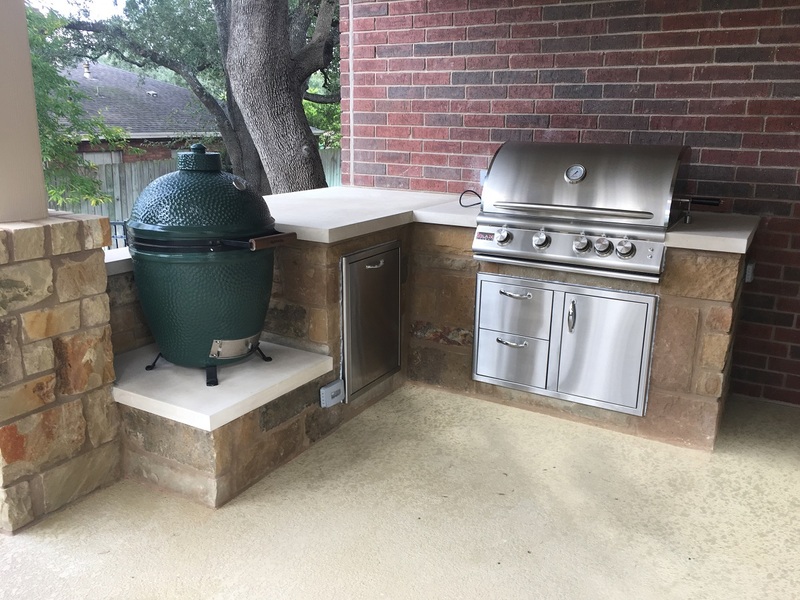 We were able to design and build exactly what these Round Rock TX clients wanted: an outdoor kitchen sized in proportion to their relatively modest covered patio. They knew exactly what they wanted, and we were happy to deliver it. • Don’t be afraid to replace a deck with a patio or vice versa. Change can be refreshing. 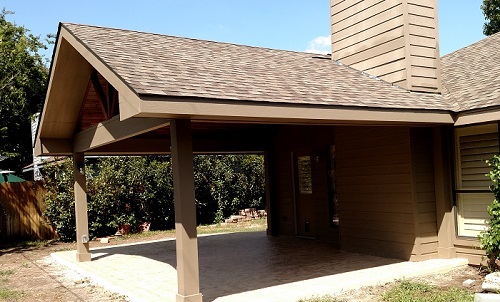 • If you want complete shade, we recommend adding a roof instead of a pergola for your patio cover. • It’s possible to add a patio roof that looks original to your home, not added on. • If you want a larger patio, and you have room for it in your yard and in your budget, build a larger patio. You can add amenities such as an outdoor kitchen or fireplace later. 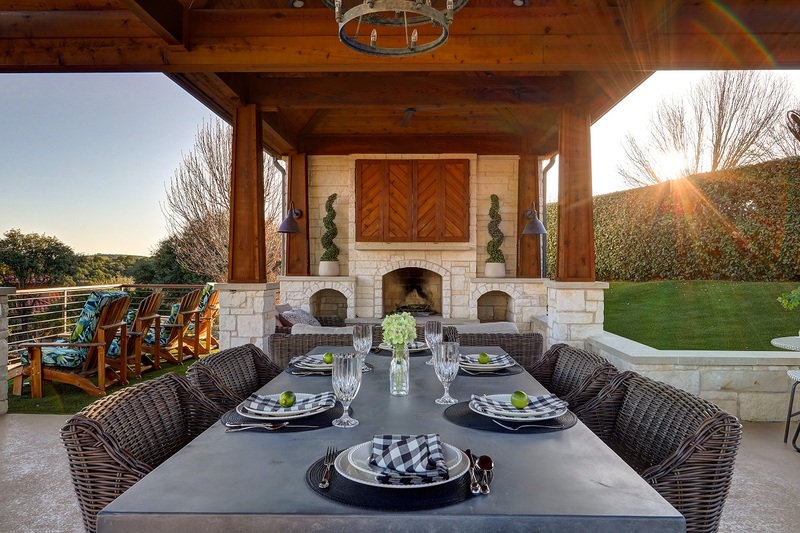 With years of experience designing and building outdoor living projects, your Archadeck of Austin design consultant knows when to keep talking. Often we can sense when a homeowner is uncertain about what they want, even when they don’t say that. We keep listening. We ask questions and explore ideas that may be new to the client. Such was the case when we designed this Round Rock patio and patio cover. We accomplished the homeowners’ original goals of increasing the size of their outdoor living space and adding a roof for total shade. We did not coerce them to replace their deck with a patio. It was their decision.